Although 40 light-years away doesn't sound too far, it would take us millions of years to reach this star system. But from a research perspective, it's a close opportunity and the best target to search for life beyond our solar system. 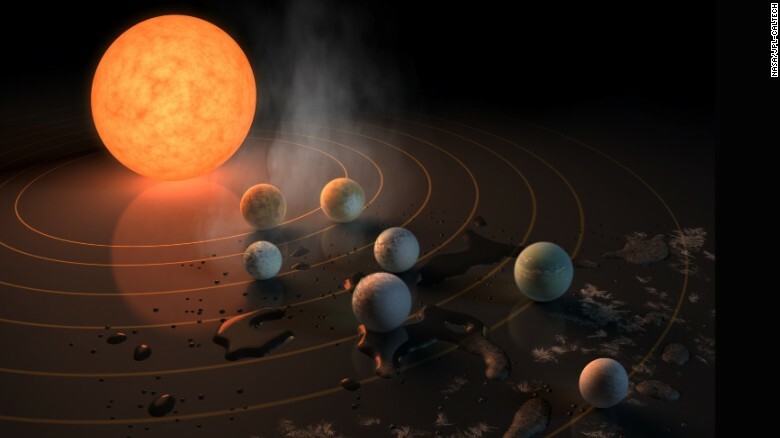 (CNN)Astronomers have found at least seven Earth-like planets orbiting the same star 40 light-years away, according to a study published Wednesday in the journal Nature. The findings were also announced at a news conference at NASA Headquarters in Washington. "This is the first time that so many planets of this kind are found around the same star," said Michaël Gillon, lead study author and astronomer at the University of Liège in Belgium. I was going to post about this but I was waiting for the NASA press conference. How interesting, isn't it. Maybe there are other "humans" or life forms closer to us than we think! I love the google doodle for the discovery. It's all over twitter too. It's so exciting! I wonder what those planets are like.